Do you celebrate the kids going back to school as much as I do? This year my youngest has been particularly bored the last 2 weeks of summer and it is making me a little nutty! 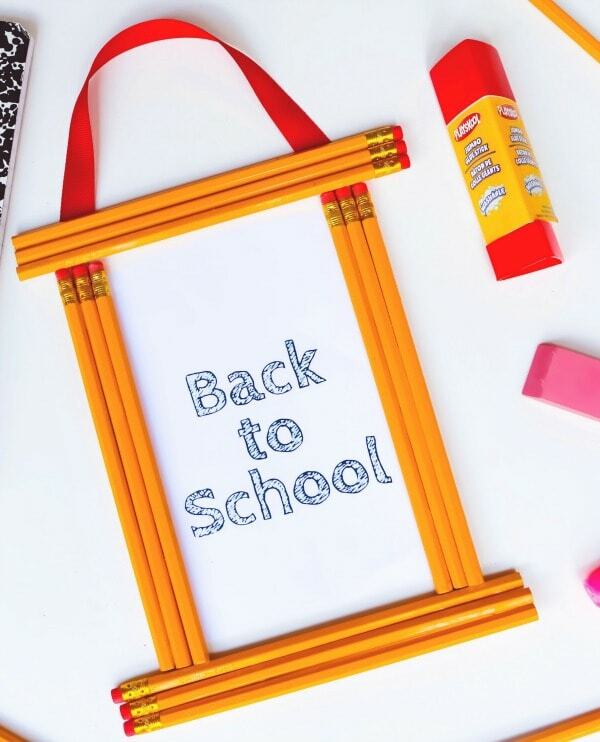 One great way to finish out summer is to do back to school crafts like this Back to School Pencil Frame Craft! Pencils are something almost every house has on hand. In fact I have a whole Ziploc bag full of pencils that we get at fairs, festivals and lots of other places! 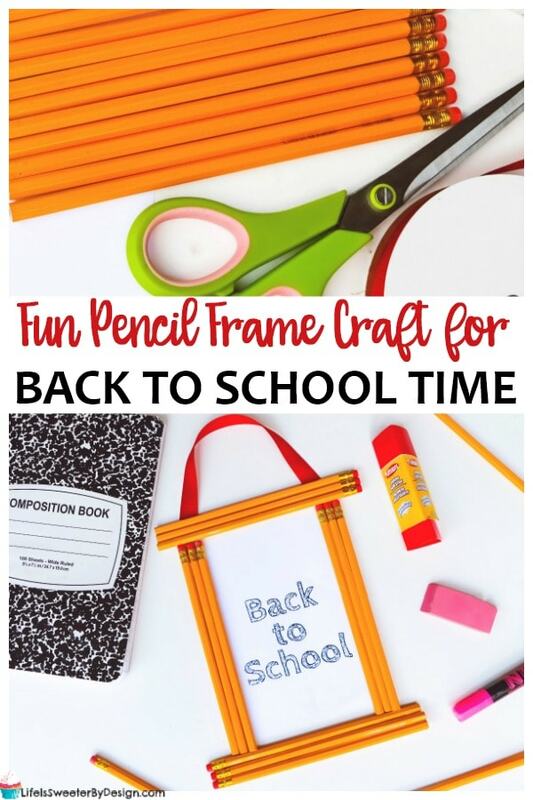 Making this easy back to school pencil frame craft is a great way to use some of those pencils!! This can also make a sweet teacher gift from your child. This DIY kids crafts only has 5 supplies. Most are things you will have around the house so you may not have to spend any money at all. That is my kind of crafting! 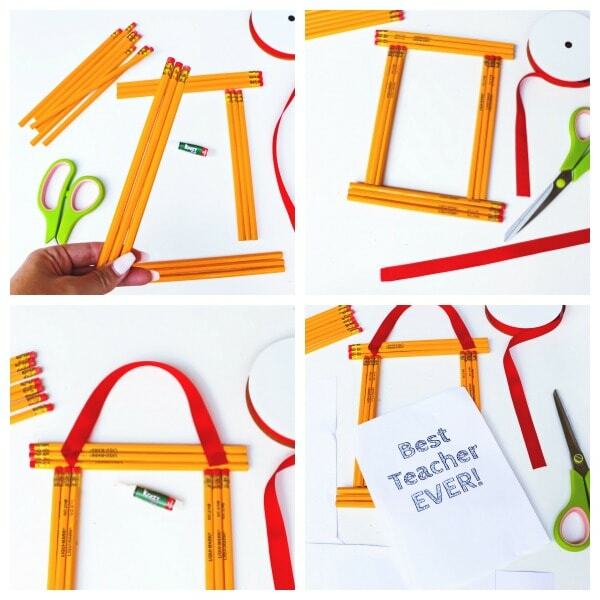 First you will get your 12 yellow pencils and lay them out in a picture frame shape. There will be 3 pencils on each side of your frame. Now is the time the parent will probably need to lend a hand if younger children are making this craft. Start gluing the pencils together with the super glue. Be sure that if the pencils have a label that the label is facing the back side of the frame. Since all 4 sides are glued together it is time to glue the 4 sides together to create the frame shape. You will need to let the pencil frame dry. Typically it doesn't take long for super glue to dry. While the frame is drying grab your ribbon and cut a piece of ribbon that will be used to hang your frame on the wall. The length is up to you. Now it is time to print off this simple printable for your frame (just click this link to print it off). Another great idea is to print off a picture of your child's first day! Cut the printable down to the frame size and glue or tape it to the back side of the frame. Need Some More Cute School Related Crafts or Snacks? If you are planning a back to school party you will need lots of fun ideas for school related crafts and snacks! I have gathered some really fun ideas! Pencil Cookies are a great snack to eat while making your pencil frame! How about playing a game of Back to School Bingo at the party?? This even comes with free printable bingo cards! Another fun treat idea are these Back to School Brownies that are decorated like chalkboards and erasers. Apples bring a lot of fun to a school party and these Apple Cupcakes with an adorable worm coming out…will thrill kids and teachers! What are you planning for back to school? Let me know how your pencil frame turns out!